Lindsay Robert “Lin” Streeter was born on May 6, 1915 in Englewood, New Jersey, according to his New York, New York National Guard Service Card. However, the Social Security Death Index said Streeter’s birth date was May 4, 1916. According to My Heritage, Streeter’s parents were Robert Lindsay Streeter and Mary (Marie) Louise Klenk. Streeter’s full name was also at My Heritage, the Internet Speculative Fiction Database, Archie Comics Wiki, and World Wrecker: An Annotated Bibliography of Edmond Hamilton (2009). In the 1920 U.S. Federal Census, Streeter was the oldest of two children born to Robert, a brokerage office clerk, and Marie. The family resided in Brooklyn, New York at 352 East 23rd Street. The 1930 census recorded the Streeter family in Westfield, New Jersey at 419 Colonial Avenue. Streeter’s father was a broker at a brokerage firm. Streeter attended the University of Pennsylvania which had this listing in its Directory of Officers, Faculty, Students, Departments 1934–1935: “Streeter, Lindsay Robert Wh 1 Westfield NJ 27 Thomas Penn Dorm”. On December 19, 1935 Streeter enlisted in the New York City National Guard. He was assigned to Company L of the 107th Infantry. Streeter was a Westfield, New Jersey resident. Streeter’s address was unchanged in the 1940 census. He was a freelance artist who had two years of college and lived with his parents and sister. Information about Streeter’s art training has not been found. From 1940 to 1942, Streeter’s illustrations were published in the science fiction pulps, Future Fiction and Science Fiction. According to Who’s Who of American Comic Books 1928–1999, Streeter’s comic book career began in the early 1940s. During World War II Streeter enlisted in the army on April 3, 1942 at Newark, New Jersey. A Soldier’s Journal: With the 22nd Infantry Regiment in World War II (2005) described the origin of a new weekly newspaper with Streeter as its cartoonist. Izzy Goldstein decided that his energy and talent were not being utilized to the fullest as a reporter for the Division weekly newspaper, The Ivy Leaf. He organized a staff and began a regimental publication. He named it Double Deucer, for “22nd” Infantry Regiment. By the second issue the paper received a hearty commendation from the Division commanding general, Major General Barton. By the their disuse the weekly had become virtually a tradition in the regiment. One reason is the pithy cartoons by ex-civilian professional cartoonist Lin Streeter. Another is the writing of fiction writer John Cheever, renowned for his stories in The New Yorker…. Streeter was named in John Cheever: A Biography (2016). Things began to look up, a little, when Cheever was transferred to Special Services a couple days later and declared editor of a weekly regimental newspaper, The Double Deucer. Paired with a cartoonist, Lin Streeter (best known for “Pat Patriot, America’s Joan of Arc”), Cheever tried to make the newspaper as entertaining as possible. Spoofing such hackneyed features as the Inquiring Reporter (I don’t know how the Major will take it, but I’m sure the men will like it”). Meanwhile he almost fell in the line of duty. On a cold day in February, an officious lieutenant insisted on helping him build a fire in the Recreation Hall, near the newspaper office, and ended up burning the place to the ground. With flames licking at his feet, Cheever ran out the back door with a typewriter and the stencil for the latest Double Deucer, which became “a special fire issue”: when copies arrived from the printer, he and Streeter singed the bundle with a blowtorch as if it had been yanked from the fire in the nick of time. The Star-Journal (Long Island City, New York), September 28, 1942, published this United Press article. 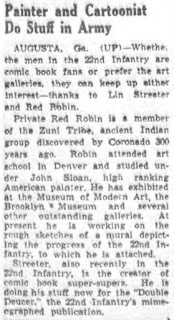 Augusta, Ga. (UP)—Whether the men in the 22nd Infantry are comic book fans or prefer the art galleries, they can keep up either interest—thanks to Lin Streeter and Red Robin. 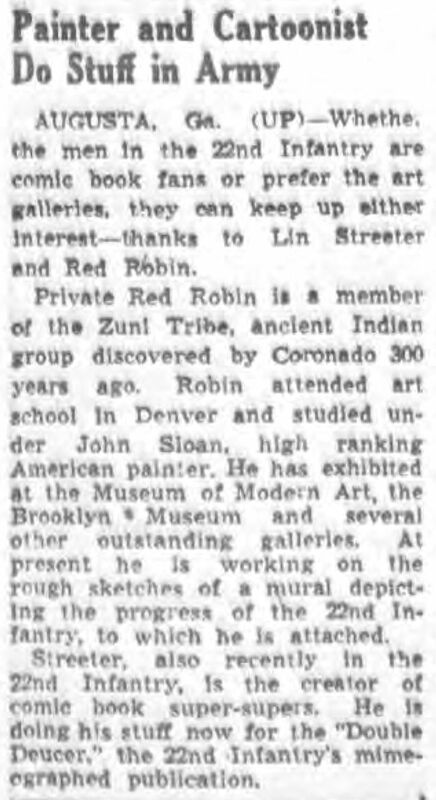 Private Red Robin is a member of the Zuni Tribe, ancient Indian group discovered by Coronado 300 years ago. Robin attended art school in Denver and studied under John Sloan, high ranking American painter. He has exhibited at the Museum of Modem Art, the Brooklyn Museum and several other outstanding galleries. At present he is working on the rough sketches of a mural depicting the progress of the 22nd Infantry, to which he is attached. Streeter also recently in the 22nd Infantry, is the creator of comic book super-supers. He is doing his stuff now for the “Double Deucer,” the 22nd Infantry’s mimeographed publication. The South Carolina, County Marriages, 1910–1990, at Ancestry.com, said Streeter married Eleanor E. Hershey on January 5, 1943 at Edgefield. Streeter was mentioned in three letters Cheever wrote to his wife Mary. A summary of each letter is at the Morgan Library and Museum: undated; February 9, 1943; and February 24, 1943. The Pittsburgh Courier (Pennsylvania), December 18, 1943, reported the results of an art contest that included Streeter. …Other participants in the art contest were professional artists Cpl. Lin Streeter, former staff artist of the Bell Syndicate, publishers of the famed character, “Captain Valor of the Marines” and “Nightime Tally,” featured in the popular comic book “The Shield;” Cpl. Larry Spivack, Pfc. Steven Vegh, Jr., and Cpl. Roy Bolitser. Streeter was mentioned in Hemingway at War: Ernest Hemingway’s Adventures as a World War II Correspondent (2016). One of Streeter’s cartoons was described in Hell in Hürtgen Forest: The Ordeal and Triumph of an American Infantry Regiment (2001). Life, April 23, 1951, printed several 1944 Christmas cards including Streeter’s hand-drawn card. When Streeter finished his army service he returned to comics. American Newspaper Comics (2012) said Streeter was one of the cartoonists to draw the strip “Sergeant Stony Craig”, which began with Don Dickson on September 20, 1937. Gerald Bouchard took over in 1941 to March 3, 1945. He was followed by Bill Draut from March 5, 1945 to July 13, 1946. Streeter continued the strip from July 15 to December 14, 1946. The strip was distributed by the Bell Syndicate. Streeter went on to work for a number of comic book publishers in the late 1940s into the mid-1950s. A chronological list of Streeter’s credits is at the Grand Comics Database. Original art of Streeter’s “The Enchanted Fish” can be viewed at Heritage Auctions here and here. Streeter’s first name was spelled “Lindsley” in the Social Security Death Index. Streeter had at least one child. The Echoes-Sentinel (Warren Township, New Jersey), March 28, 1985, reported the engagement of his son, Richard, and Gail Bennett. Mr. and Mrs. Edward Bennett of Basking Ridge have announced the engagement of their daughter, Gail Ellen Bennett, to Richard S. Streeter, the son of Mrs. Eleanor Streeter, also of Basking Ridge, and the late Lindsey [sic] Streeter. Both are graduates of Ridge High School. Miss Bennett attends Bloomsburg University in Pennsylvania. Mr. Streeter is the owner of Streeter’s Taxidermy. No date has been set for the wedding. Henri Andre Fluchere was born July 31, 1914 in Marseille, France, according to his Petition for Naturalization at Ancestry.com. On November 11, 1925, Fluchere, his parents, Armand and Emma, and sister, Odette, sailed aboard the S.S. Aquitania from Cherbourg, France. They arrived in the port of New York City on November 27. Something About the Author, Volume 40 (1985) profiled Fluchere and said he attended Brooklyn College from 1933 to 1935, then City College from 1935 to 1936. Fluchere filed a Petition for Naturalization on September 1, 1936. Fluchere stated that he had resided in New York County since June 30, 1933. His occupation was commercial artist and residence at 234 West 22nd Street, New York City. Fluchere was naturalized on December 23, 1940. Manhattan, New York City telephone directories, from 1942 to 1946, listed Fluchere at 125 West 58th Street. Fluchere enlisted in the army on April 28, 1942. According to Fluchere’s son, Michael, his father served in the “Military Intelligence as an Interpreter (French) as a Master Sergeant with the 28th Infantry Division. After the 28th Infantry Division crossed the Rhine River into Germany, his services were no longer needed and he was reassigned to The Stars and Stripes Newspaper in Paris as an illustrator and artist. After returning from World War II, he worked for Superman Magazine as an illustrator.” Something About the Author said Fluchere received the Purple Heart. According to the Department of Veterans Affairs BIRLS Death File, Fluchere was discharged December 11, 1945. According to Something About the Author, Fluchere married Ruth Allen in 1944. They divorced January 1946. Fluchere married Maud Elliot Hall (a musician) on September 4, 1946. Earlier, the Philadelphia Inquirer, May 3, 1946, published the engagement announcement. On August 2, 1946, the Inquirer reported the upcoming September wedding. A full account of the marriage appeared in the Inquirer on September 5, 1946. The Swarthmore Presbyterian Church formed the setting for an attractive wedding yesterday, when Maud Elliott Hall, daughter of Mr. and Mrs. John Howe Hall, became the bride of Henri A. Fluchere, son of Mr. and Mrs. Armand Fluchere, of New York. The ceremony was solemnized at half after two o'clock, with Rev. David Braun officiating. The bride, who was given in marriage by her father, wore a period sown of ivory tone slipper satin, the model featuring a square neckline, with short sleeves and a train suspended from the shoulders. The gown was trimmed with heirloom duchess lace. Her tulle veil fell from a lace cap which had been worn by her great-grandmother, the late Mrs. Julia Ward Howe, and she carried a bouquet of roses and bouvardia. Grisella C. Hall, who acted a s maid of honor and only attendant for her sister, wore a frock of aqua taffeta, made on tailored lines, with a high neckline. She carried a bouquet of chrysanthemums in autumn shades and her headdress was an artistic arrangement of matching flowers. Mrs. Hall chose a graceful black marquisette gown, with a matching hat, the latter trimmed with flowers in variegated colors. With this went an orchid corsage. The bridegroom’s mother also chose black in a floor-length crepe gown, with a ribbon-trimmed hat of the same color. She, too, wore a corsage of orchids. Murray Boltinoff, of New York, served as best man. There were no ushers. A small reception at the home of the bride’s parents for members of the immediate families followed the ceremony. Upon their return from a wedding trip, the couple will make their home in New York. The bride is a granddaughter of the late Mr. and Mrs. David Prescott Hall, of Plainfield, N. J., and of the late Mr. and Mrs. Edward Henry Earnshaw, formerly of this city. She is a great-niece of Mrs. Maud Howe Elliott, of Newport, R.I.
Fluchere worked at National Comics beginning in 1946. Something About the Author said Fluchere attended Columbia University from 1946 to 1948. The Daily News (Tarrytown, New York), March 1, 1949, reported Fluchere’s upcoming talk in the column, Happenings Here and There in the Village. Comic Books—Henri A. Flushers [sic], commercial artist and production manager of National Comics, will tell the story behind the tremendous volume of comics produced today, to the Irvington Kiwanians at their meeting in the Hotel Florence at 7:15 P.M. tomorrow. He is also expected to discuss the recent trend to legislative control of comics. 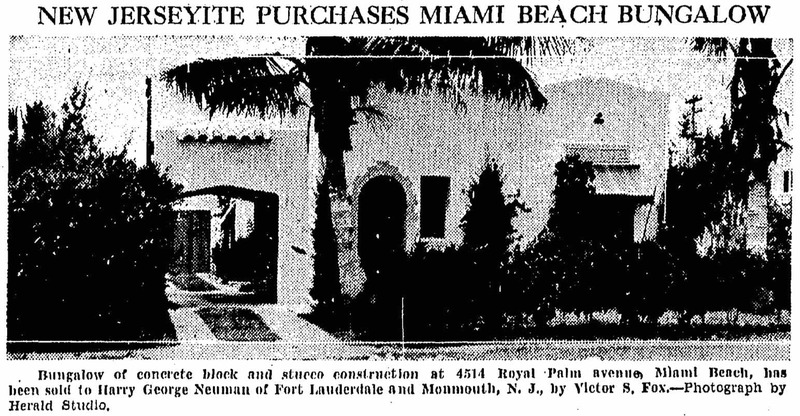 The Daily News, March 3, 1949, reported the event. Irvington Kiwanians heard Henri A. Fluchers [sic], commercial artist and production manager of National Comics, talk last night on the different aspects and kinds of art used in advertising and commercial art. Fluchers brought illustrations of every kind of art used commercially, including photographs, half tones, line drawings, color reproductions and several others. He was expected to speak on comic books, but touched only briefly on that subject when he said that his company was very much opposed to the bill now in the Legislature, to control comics. He also said that his company employs a child psychologist to go over every strip and suggest improvements and changes. Something About the Author said Fluchere began his freelance writing career in 1950. He was art director for McGraw’s Technical Writing Service from 1950 to 1953. Something About the Author said Fluchere was an Irvington village trustee from 1958 to 1960; police commissioner from 1958 to 1960; and acting mayor from 1959 to 1960. Popular Science published Fluchere’s tip in the August 1961 issue, and his article in January 1962. Something About the Author said Fluchere wrote “The Westchester Winetaster,” a weekly column in Westchester newspapers. He was a member of the American Wine Society. Fluchere passed away November 25, 1991. Victor Samuel Fox was born on April 13, 1893 in Nottinghamshire, England. Birth information is based on Fox’s World War I and II draft cards, Who’s Who in Finance and Industry (volumes 7 and 9) and death certificate. The 1900 U.S. Federal Census had April 1893 as Fox’s birth month and year. However, Fox’s New York, World War I military service card had March 23, 1893 as his birth date. A third birth date, July 3, 1893, has been given by other publications and websites. Fox’s World War II draft card had his full name as “Victor Samuel Fox”. In the 1900 census, Fox’s name was recorded as “Samuel V J Fox”. The initial J was for Joseph according to some publications and websites. Census, military, naturalization, marriage and travel information are from Ancestry.com. Albany, N.Y., Feb. 23.—Harry T. Johnson, Inc., ladies’ ready-to-wear apparel, $10,000; E. Goodman, V.S. Fox, H.T. Johnson, Hotel McAlpin. 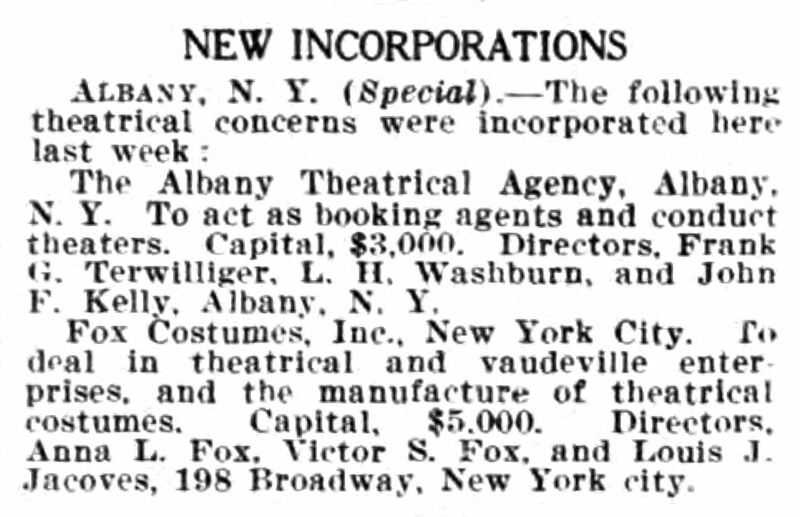 Fox Costumes, Inc., theatrical costumes, theatrical, vaudeville enterprises, $5,000; L. J. Jacoves, A. L. and V. S. Fox, 555 W. 151st St.
Fox Costumes, Inc., theatrical costumes, theatrical, vaudeville enterprises, incorporated at Albany, Aug. 15, for $5,000. L. J. Jacoves, A. L. and V. S. Fox. Albany, N. Y. 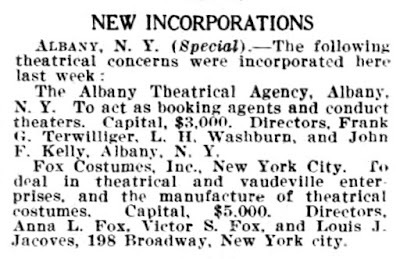 (Special).—The following theatrical concerns were incorporated here last week:Fox Costumes, Inc., New York City, To deal in theatrical and vaudeville enterprises, and the manufacture of theatrical costumes. Capital, $5,000. Directors, Anna L. Fox, Victor S. Fox, and Louis J. Jacoves, 198 Broadway. New York city. Amounts of $100 and over. Fox, Victor S. & Co., 47 Broadway. Consolidated Maritime Line Here Buys Former Austrian Steamer. Board Announces Receipts from Sale of Former German Vessels. Federal Officials at Work Following Purchase of Shipping Board Vessels. Interest was caused in shipping circles yesterday by the report that Federal authorities were investigating certain phases of the purchase of a number of steamships by Victor S. Fox & Co., Incorporated, and the Consolidated Maritime Lines, Incorporated, of 47 Broadway…. Allied Capital Corporation Enjoined on Prosecutor’s Plea. Washington, Oct. 3.—Control of twelve Shipping Board vessels, valued at more than $6,500,000, obtained by Victor S. Fox of New York on the partial payment plan, has been withdrawn…. …it was understood that a receiver had been appointed for the Victor Fox, Inc., the Consolidated Maritime Lines, Inc., and other steamship lines of which Fox is President…. Federal Jury Holds President and Treasurer for Deal with Shipping Board. Victor S. Fox, President, and William H. Kaiser, Treasurer, of Victor S. Fox & Co., Inc., were indicted yesterday by the Federal Grand Jury on a charge of attempting to defraud the United States Shipping Board by presenting accounts and vouchers…. …It is charged in the indictment that on Aug. 11, 1920, the defendants, “for the purpose and with the intent of cheating, swindling and defrauding the Government of the United States and the United States Shipping Board,” made a false account and certificate…. …Fox was held in $10,000 in bail and Kaiser in $7,500. Bankruptcy Forced on Fox, 13 S. S. Cos.
An involuntary petition in bankruptcy was filed in the Federal Court yesterday against the Victor S. Fox Company, Inc., of 47 Broadway, by three creditors….The Fox Company and its affiliated concerns consented to the decree…. Victor S. Fox, 47 Broadway, $1,236.16 claimed by Gordon Beattie for wages as master of s.s. Isonomia (U.S. Dis. Ct., S.D., N.Y.). Notice to Creditors of Victor S. Fox and Company, Inc., States Steamship Corporation, American Merchant Marines, Inc., Atlantic Adriatic Steamship Corporation, French American Line, Inc., Standard Steamship Company, Inc., International Maritime Corporation, Italian Star Line, Inc., and all Allied Lines of the Above Named. 49 Fox, Victor S., & Co.
Fox, Victor S., & Co., N. Y. Shipping Board Counsel Says He Did Not Exercise Influence in Receiverships. …Victor S. Fox of Victor S. Fox & Co., 47 Broadway, one of the thirty-nine principal and subsidiary shipping companies under receivership in this district, said that he could give important information concerning Mr. Conrad, Mr. Nicoll and Mr. Carson, if called to testify. Mr. Fox added that the indictment against his firm, now pending in the United Stated District Court, was the result of the activities of men who are now facing an inquiry themselves. Receivership for twenty-nine steamship companies, formerly arranged in seven groups in as many separate appointments, is now united, with James G. Graham, 11 Broadway, named by Judge Julius M. May of the United States District Court as receiver. The unification of receivership has been ordered in an attempt to save unnecessary expense and to simplify litigation in which the United States Government, through the Shipping Board, is the principal complainant and largest creditor. Mr. Graham succeeds Shipping Board officials previously appointed. Notices to creditors have been published asking that all file their claims with the new receiver. John G. Pore, 11 Broadway, is Mr. Graham’s attorney…. …Consolidated Maritime Lines, Victor S. Fox & Co., Tonowanda Navigation Company, Muscoota Navigation Company, Moshulu Navigation Company, Monongahela Navigation Company, Chillicothe Navigation Company, Arapahoe Navigation Company, Mount Shasta Navigation Company, Jeanette Steamship Company, Isonomia Steamship Company, Coosa Steamship Company, Castlewood Steamship Company and Armenia Steamship Company. …Victor S. Fox, a theatrical costumer, began business on a shoe string, and for a time had hopes of making himself a figure in the steamship world. He bought ships at ten per cent cash and expected to pay off the remainder from current earnings. Unfortunately he went in on the ebb tide, which soon left him stranded on the sand. The steamer City of Seattle which is due in New York from Jacksonville, Fla., tomorrow morning, will be the first boat to sail under the New York-Atlantic City Steamship Line, next month, according to Victor S. Fox, president of the new corporation…. Victor S. Fox. president of the New York-Atlantic City Steamship Co., and his associates in the New York, Albany and Western Steamship Co., started a new service from New York to Albany and Troy, beginning Wednesday with the departure of the steamship, Lancaster, from Pier 46, North River. Sailings will be maintained every Monday, Wednesday and Friday. Mr. Fox says that other ships probably will be added later. Associated with him is H A. Lamb, as vice-president and general manager. The Lancaster was formerly operated from Baltimore on the Chesapeake. Mr. Fox announced that the fare will be $1 and the rates will range from 75 cents for berths to $5 for staterooms. The ship has accommodations for 400 passengers. The dining service will be cafeteria style. New York & Atlantic City Steamship Co.
41732. (Buffalo, N. Y.) Will you kindly favor us with an expression of your judgment relative to New York Atlantic City Steamship Company, whose address Is Pier 12, East River, New York? A client of ours who has made an investment In the company is desirous of securing some information concerning the stability and the possibility of the stock in the above company. …Victor S. Fox of the Allied Capital Corporation, 49 Broadway and 331 Madison Avenue, was arraigned yesterday before United States Commissioner A. O’Neill and held in $7,500 bail on a charge of using the mails to defraud….Fox, according to the prosecutor, operated a “sell and switch” stock concern. He said Fox also had a desk room at 230 Park Avenue as “Fox Motor and Bank Stocks, Inc.,” and as “American Common Stocks, Inc.”…Fox was arrested yesterday. …Victor S. Fox of the Allied Capital Corporation of 49 Broadway and 331 Madison ave., was arraigned and held in $7,500 bail on a mail fraud charge…. …a temporary injunction restraining the Allied Capital Corporation and Victor S. Fox from doing further business. It is charged that they accepted money from investors for foreign Ford stock and failed to deliver the stock…. 4 Indicted in Stock Sales. Mail Frauds Charged to Group That Dealt in Ford of France. The Federal grand jury late yesterday indicted Victor S. Fox, Fred H. Hallen, I. Lloyd Zimmer and William McManus on a charge of using the mails to defraud in connection with their stock-selling activities for the Allied Capital Corporation at 300 and 331 Madison Avenue and 49 Broadway…. The Allied Capital Corporation was another pretentious enterprise of this kind. Its principal, Victor S. Fox, is now being held under a charge of larceny. World Astrology Magazine, for January, 1939, recommends purchase of McKesson & Robbins securities. Victor S. Fox, editor of the magazine, was called before Assistant Attorney General McCall of New York State to explain. Fox said McKesson & Robbins was included under the “armament group,” and that since January looked like a good month for armament stocks. World Astrology recommended it. This untoward event and its even more un toward explanation need not cause loss of astrological faith, however. It may be an astrological phenomenon in reverse. The McKesson & Robbins investors undoubtedly will see stars on the next dividend date. Fox Feature Syndicate’s first comic book was Wonder Comics, #1, May 1939, which featured Wonder Man. On the third issue, Wonder Comics was retitled Wonderworld Comics. N. Elliott Stuckel, for nine years with CBS, has been named director of the promotion division of Fox Feature Syndicate, according to an announcement by Victor S. Fox, president. Mr. Stuckel will handle radio, newspaper and merchandising contacts. Fox, Victor S., New York, and R.W. Farrell, Bronx, N.Y., said Fox assignor, by mesne assignments, to said Farrell, Optical projector. 2,301,114; Nov. 3. Fox-Bellvage—Victor Fox, 50, of Manhattan, and Carolyne Bellvage, 36, of 84-46 Smedley street, Jamaica. Testimony that a special account to pay Army contract officers for aid in obtaining Government war business had been set up by the Cornwall Shipbuilding Company, was given yesterday by Victor S. Fox, a former partner of the company, at the general court-martial of Capt. Joseph (Joe) Gould, former prize fight manager until he entered the Army Transportation Corps two years ago…. …The attention of The Times has now been called to the fact that Victor Fox was not named as a co-conspirator. Mr. Fox, who was a witness for the Government, testified that he sold his interest in the company as soon as he learned of the contract involved in the proceeding. The Times is glad to take this opportunity of expressing its regret for the error. Victor S. Fox, magazine publisher, has purchased for occupancy from Mrs. Amy E. Wing the five-story dwelling at 59 East Eighty-second Street. The property occupies a lot 18 by 100 feet and is assessed at $40,000…. Potsdam Paper Mills, Inc., of Potsdam, N.Y., on the Racquette River, has been acquired by a syndicate headed by Victor S. Fox, president of Fox Feature Syndicate, Inc., publisher of comic magazines, and Central Color Press, Wilkes-Barre, Pa., printer of such magazines, it was announced yesterday. The purchase, Mr. Fox said, gives his group a completely integrated operation. New York—(AP)—Potsdam Paper Mills of Potsdam, N.Y., have been sold to a syndicate headed by Victor S. Fox, New York comic magazine publisher. The price was not disclosed in the company’s announcement yesterday. Fox is president of Fox Feature Syndicate, Inc. The Potsdam plant manufactures newsprint and cover stock, chiefly from reclaimed waste from the binding operations of the Central Color Press, Inc., at Wilkes-Barre, Pa. Additional machinery and equipment are being installed. Roland I. Mead has been named mill manager. He formerly was consulting engineer with American Industrial Company. Airline: Trans World Airlines, Inc.
FOX, Victor Samuel, publisher; b. Nottingham. Eng., Apr 13, 1893: s. Joseph and Betsy (Duschae) F.: came to U.S., 1898, naturalized, 1904: grad. B.M.C. Durfee High Sch., Fall River, Mass., 1911; m. Carolyne Bellvage, Aug. 8, 1943: 1 dau. Victoria Ann. Pres. and chmn. bd. Consolidated Maritime Lines. Inc, shipbuilders and operators, 1919-22: Industrial engr., adviser on reorganizations to large corporations. 1922-35; chmn. and pres. Fox Feature Syndicate, Inc., New York, N.Y., also 10 affiliated companies, since 1935; president Central Color Press, Incorporated, publication printers, Wilkes-Barre, Pa.: pub. 20 monthly newsstand mags. ; creator and owner of 119 comic feature characters appearing in Magazines and newspapers throughout the world. Home: Palmer Hill Rd., Greenwich, Conn. Office: 60 E. 42d St., N.Y. City 17. FOX, Victor Samuel, pres. Key Industries. Inc.. Renard Investments, Ltd. Address: 142 E. 49 St., N.Y.C. 17. With profound sorrow we announce the passing of our believed fellow member, Victor S. Fox.National Democratic Club. According to the death certificate, Fox was laid to rest at Woodlawn Cemetery. In response to an email request, Woodlawn Cemetery provided the location: Arbutus plot, section 184, lot 16592. Fox’s death information is incorrect. Excellent profile but date of death is incorrect.